Established in 1972, Lalit Narayan Mithila University is a Public University located in Darbhanga (Bihar). In starting, University was functioning from Mohanpur House of Darbhanga but later in the year 1975, it was shifted to Palatial Unique Raj Campus. Accredited with B Grade by NAAC, University offers various Diploma, Certificate, and Vocational courses and has 43 constituent and 24 Affiliated colleges in 4 districts of Bihar as in Darbhanga, Madhubani, Samastipur, and Begusarai. 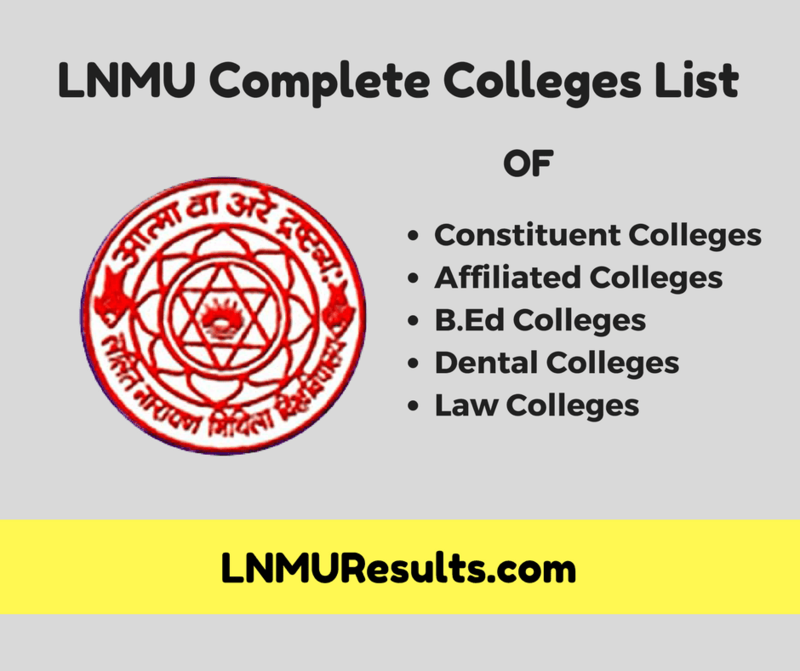 If you are looking for the LNMU Darbhanga College List then here you can find the complete index of LNMU Affiliated College List and B.Ed Colleges. Here's the complete index of Constituent and Affiliated Colleges of Lalit Narayan Mithila University that includes Dental & B.Ed Colleges, Law Colleges and Self Financing Institutes. Right now, the total number of Colleges under LNMU Darbhanga is 67 and they have a complete list of all the Constituent and Affiliated Colleges on the official website along with the Principal name and contact details as well. Lalit Narayan Mithila University (LNMU) Darbhanga has a total of 43 constituent colleges in all the 4 districts of Madhubani, Darbhanga, Samastipur and Begusarai right now. Here's the list of those colleges along with the official websites. University has some affiliated B.Ed Colleges and 2 Dental Colleges as well. Here's a list of Affiliated Bachelor of Education (B.Ed) Colleges under LNMU along with their distrcits and place. & after all, Here are only 2 Affiliated Dental Colleges of Lalit Narayan Mithila University along with their official websites. So, it was the complete and overall list of all the Constituent and Affiliated Degree, B.Ed and Dental Colleges. If you need any further pieces of information regarding colleges. You can drop a comment below and I will be happy to help you with that particular information and update this post as well. I hv one doubt.plz clear my doubt.